Through visual expression we can learn to be true to our own voice, our own pace, and our own choices while listening to and being guided by God’s Spirit. This day will awaken and celebrate the creative process in your life through a variety of prayer forms, Scripture, reflection, and hands-on expression with art materials. Very simple art materials (paint, collage, and clay) will be used. NO previous art experience is necessary! Glenda Dietrich Moore, M.Div., B.F.A., Lincoln, Nebraska, is an artist and ordained minister with the Christian Church (Disciples of Christ). Glenda leads workshops and retreats on art and faith, helping people experience balance and renewal through the creative process. Her website is www.GlendaDietrich.com. 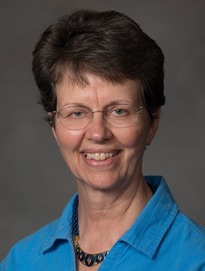 Glenda Dietrich Moore, Lincoln, Nebraska, M.Div. and B.F.A., is an artist, art instructor, certified spiritual director, and ordained minister with the Christian Church (Disciples of Christ). Her ministry in the arts, called Creation Energy, celebrates faith, expression and the vibrancy of life. Glenda leads workshops and retreats on art and faith, helping people experience balance and renewal through the creative process. Her website is www.GlendaDietrich.com.